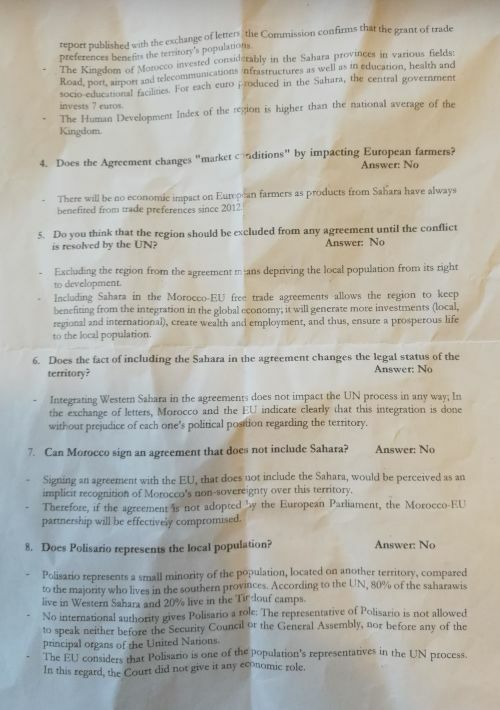 A briefing distributed by Moroccan officials in the corridors of the European Parliament claims, among other things, that “signing an agreement with the EU that does not include the Sahara, would be perceived as an implicit recognition of Morocco’s non-sovereignty over this territory”. During the month of October 2018, several Members of the European Parliament from different political groups have been given a two-page “fact sheet” by Moroccan diplomats. The document is entitled “Questions and answers – Regarding the adaptation of the agricultural protocol”. See the document below. The text is neither dated nor presented with a signatory author. The text is remarkable, in that the Moroccan lobbyists explicitly state that “[s]igning an agreement with the EU that does not include the Sahara, would be perceived as an implicit recognition of Morocco’s non-sovereignty over this territory”. This is exactly the point that Western Sahara Resource Watch (WSRW) repeatedly stress. If the EU were to include the occupied parts of Western Sahara into a new trade agreement with the occupying power of Morocco it would show an unambiguous sign of recognition of the legitimacy of Moroccan control over that territory, in direct contradiction with international and European law. Similar statements have repeatedly been issued by the Moroccan government on the EU trade agreements, for instance by the Minister of Information. The Court of Justice of the EU, the EU member states and the UN are clear in that it does not recognise the Moroccan sovereignty over Western Sahara. The document also contains a number of lies and inaccuracies. Here are our views on the affirmations of the briefing. 1. “The amendment to the agriculture protocol is in compliance with the judgement of the Court”. According to the briefing, “the Commission and the Council legal services stated that the adaptation is in line with the Court’s judgement”. This statement is surprising since the opinions of the Commission and Council legal services are not public, nor are they accessible to MEPs. Either the Moroccan mission has privileged access to confidential Council and Commission documents (which would be a serious breach of EU confidentiality rules), or it has no basis for making such claim. The Legal Service of the European Parliament states the legality of the proposal is "unclear". 2. “The consent of the people of Western Sahara required by the judgement of the Court of Justice has been obtained”. -“The Kingdom of Morocco asked for the consent of the population representatives”. Morocco is, according to the Court of Justice of the EU, a “separate and distinct” territory from Western Sahara. Since it rejects being both the administrative power and the occupying power of the territory, it has no legal basis for its presence in and its action on behalf of the territory concerned. Moreover, it is not up to Morocco to ask for the consent, but for the EU to secure the consent of the Saharawi people to the proposed agreement. - “According to the UN, 80% of the Saharawis live in Western Sahara and 20% in the Tindouf camps”, the document reads, without quoting a source - quite possibly because the UN has not made any statement to support this claim. - “Excluding the region from the agreement means depriving the local population from its right to development”. The rights of the local population are irrelevant. The Court addresses the rights of the people, not the population. Today, the majority of the population of Western Sahara consists of illegal settlers. It is up to the people of the territory, not Morocco or the EU to decide on the trade relations of the territory of Western Sahara. It is a paradox in itself to claim that excluding Western Sahara means that one prevents the locals from development: The proposed deal itself suggests to only cover a part of the non-self-governing territory, meaning that it excludes a large part of the territory, including around half of the Saharawi people. A UNHCR report from March 2018 of the Saharawi refugee living in the Tindouf camp assessed the population therein at over 175,000 persons. - “No international authority gives Polisario a role: The representative of Polisario is not allowed to speak neither before the Security Council or the General Assembly”. Imprecise. As underlined by the Court of Justice of the EU (paragraph 35), the Polisario is recognised by the UN General Assembly resolution 34/37 as the representative of the people of Western Sahara. As a signatory to the Geneva Conventions, Polisario is representing the territory as a national liberation movement of Western Sahara as in the international conflict with Morocco. National liberation movements as such do not have the right to speak before the Security Council or the General Assembly. - “The Commission launched a consultation process with the Polisario Front and NGOs”. Incorrect. Even though the EEAS claims in the Staff Working Document to have engaged Polisario in a consultation process, it has not done so. None of the NGOs consulted by the Commission advocate for self-determination – all four NGOs consulted by the EEAS are Moroccan, and all four advocate the Moroccan position of the conflict. 94 of the 112 groups that the Commission claims to have been consulted, were not in fact consulted by the Commission – they have been added to the list of consulted groups without permission. The Commission did not travel to Western Sahara nor to the refugee camps to carry out its consultations. This basic fact underscores the lack of credibility of the consultation process. - “According to the Commission, ‘These consultations revealed a majority opinion in favour of amending the liberalization agreement in order to extend tariff preferences to Western Sahara products”. It is correct that the majority of the groups met by the Commission in its consultation process expressed such support. However, these only constitute 18 groups and individuals, and they are all either Moroccan or pro-Moroccan. None of the 94 Saharawi groups or pro-Saharawi groups enlisted in the annex of the EEAS working document, who all advocate for self-determination, were ever part of the consultation process. 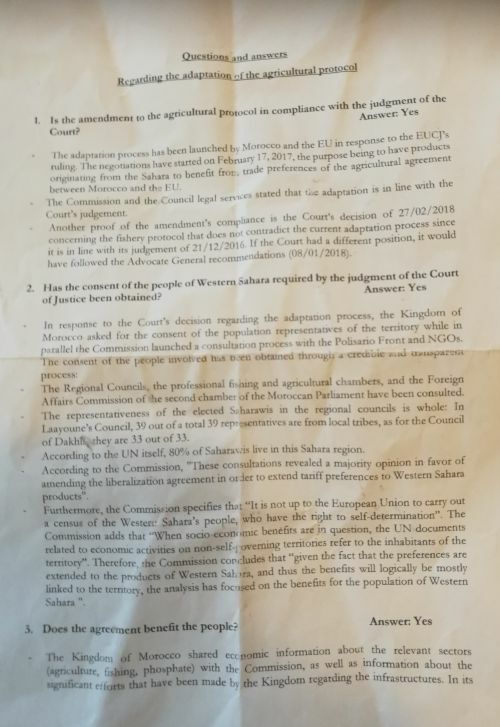 The purpose of the consultation process on local benefits from an EU-Morocco agreement has nothing to do with the obtaining of consent required by the Court. The Commission did not travel to Western Sahara nor to the refugee camps to carry out its consultations. This basic fact underscores the lack of credibility of the consultation process. There are no independent statistics or figures that support that claim. The only available figures are provided by Moroccan ministries or government bodies, which have a vested interest in maintaining an air of 'normalcy' regarding Morocco's presence in Western Sahara. By the EU Commission’s own admission, it cannot provide any figures to back up the claim that the agreement it beneficial to Western Sahara as “available data is often fragmentary” or “patchy and disparate”. As the Commission acknowledges, it is “generally impossible to distinguish Moroccan imports from Western Saharan imports”. “There is no independent UN-commissioned analysis of the benefits of international trade agreements for Western Sahara. Moreover, the EU has no competence for or direct means of investigating the territory of Western Sahara”, the Commission admits. There are no figures on the trade flows to and from Western Sahara. The Commission also admits that it cannot distinguish between the Saharawi and Moroccan populations in terms of employment benefits, yet recognizes that the share of Saharawi employees in the affected sectors is minimal. As Parliament's rapporteur on the file admits, not all groups in the territory participate in the economic development. The UN puts it even more boldly. In her end-mission statement of her trip to Western Sahara in late 2015, the UN's Special Rapporteur on the right to food Hilal Elver noted that the people of Western Sahara were not equally benefiting from the economic projects that Morocco was undertaking in the territory. Around the same time, the UN's Committee on Economic, Social and Cultural Rights highlighted that poverty continued to affect the Saharawi population disproportionately and that it was not reaping the benefits of the considerable investments being made. The sectors that stand to benefit from the agreement are overwhelmingly owned by Moroccans. The text reads that "There will be no economic impact on European farmers as products from Sahara have always benefited from trade preferences since 2012”. This ignores the fact that the EU Commission today has no trade statistics from the territory, and that the Moroccan government has announced plans for substantial growth of export-oriented production in Western Sahara. These plans are actually highlighted in the accompanying report of the Commission/EEAS. Key agricultural organisations throughout Europe oppose the deal as production of agriculture on occupied land constitute unfair competition. In the Opinion on the proposed agreement, the French EPP Rapporteur clearly wasn’t impressed by the arguments of the Moroccan mission and highlighted “the major competitiveness issues for European producers” and the lack of clarity concerning the allocation of tariff rate quotas. Furthermore, the AGRI rapporteur emphasised that there are still major competitiveness issues in terms of labour costs, working conditions and environmental standards. Leading European farmers cooperatives oppose the agreement. Western Sahara is explicitly excluded from Morocco's trade agreements with the EFTA States (Norway, Iceland, Liechtenstein and Switzerland), as doing otherwise would implicate a sign of recognition of Morocco's self-proclaimed sovereignty over the territory. For that same reason, Western Sahara is also expressly excluded from the US-Morocco Free Trade Agreement. 6. "The inclusion of [Western] Sahara in the agreement does not change the legal status of the territory." It is indeed factually correct that the inclusion of Western Sahara in the agreement does not change the legal status of the territory; its status is and will remain that of a non-self governing territory until the United Nations decides otherwise. Interestingly, the argument put forward under this assertion does not address the legal status but that of the UN peace talks: “integrating Western Sahara in the agreement does not impact the UN peace process in any way”. The inclusion of Western Sahara into the current agreement would directly and negatively affect the UN peace talks since it would provide EU political backing to Morocco’s illegal claims to the territory, which the CJEU states is “distinct and separate” from Morocco, strengthen Rabat’s interest in preserving the status quo, which is to its favour, and provide a further dis-incentive for Morocco to engage in earnest in any UN talks about the territory. 7. "Morocco cannot sign an agreement that does not include [Western] Sahara." It can and it has. Morocco has signed trade agreements with the EFTA countries (Norway, Switzerland, Iceland and Liechtenstein) and the USA that expressly do not apply to Western Sahara. 8. "Polisario does not represent the local population"
Polisario represents the people of Western Sahara, as established by the UN General Assembly and repeated by the EU Court of Justice. Polisario thus represents the people that ought to consent to any EU-Morocco agreement affecting the territory of Western Sahara. As such, Polisario does not represent the population of Western Sahara, which includes Moroccans that have moved into the territory over the economic and financial incentives deployed by the Moroccan government to encourage such moves.